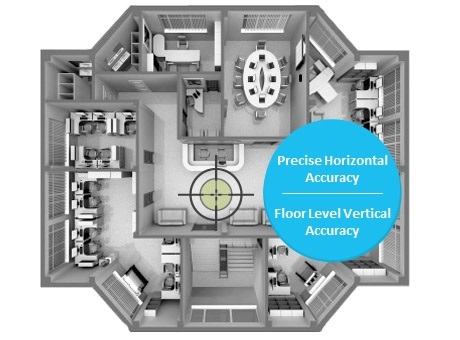 With unparalleled accuracy in all three dimensions, an extremely rapid time to first fix, and carrier-grade reliability, NextNav delivers what GPS can’t: precise location in indoor and urban environments. Created to seamlessly integrate with GPS, NextNav has made key technical decisions to ensure that our technology can be rapidly integrated into existing carrier operations. GPS provides excellent service as long as the receiver has an unobstructed view of the sky. But because its signal is very faint, it can’t usually be received indoors, and is often obstructed in urban areas even when outdoors. Using powerful terrestrially-based transmitters, NextNav brings accurate location service, with carrier-grade reliability, into buildings and urban areas where satellite-based GPS signals can’t reach. Our network transmits a very precise timed signal and information about the placement of NextNav transmitters over a GPS-like channel. Every NextNav transmitter is precisely synchronize using proprietary techniques to ensure accuracy. We also support the computation of very accurate height information using differential barometric pressure measurements, similar in some respects to an aircraft altimeter. Each NextNav transmitter measures key environmental statistics and relays them to the receiver along with the timing and other encoded information. Because these transmissions occur over near-nationwide licensed spectrum in a band designated for location services, NextNav can offer a precision location solution almost anywhere cellular service is available. 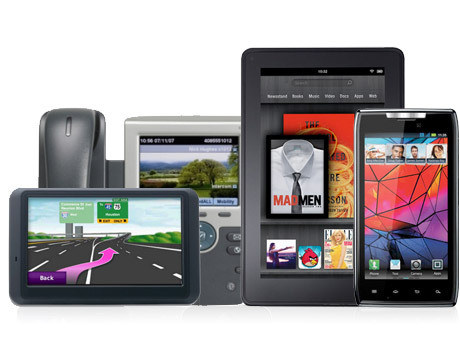 Unlike GPS, NextNav’s technology is based on a network of powerful terrestrial broadcast transmitters. GPS signals are very faint, and lie very far below the so-called “noise floor”. That means that it takes a very long time to “find” the GPS signal and acquire enough information from it to compute a position. NextNav, by virtue of its terrestrial infrastructure, has a very strong signal that can be acquired swiftly, typically providing a position in ≈2 seconds. NextNav’s location technology is delivered over a managed network, designed from the ground up to provide service across an entire metropolitan area to nearly every location where a cellular signal can be received. 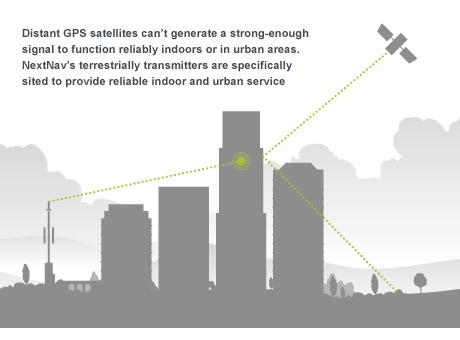 GPS was designed to provide global outdoor coverage, but was not designed to work in buildings or in dense urban areas. By using our custom RF planning tools designed for location networks and rigorously testing and tuning our deployment before service launch, NextNav ensures a >99% yield across its entire service area, whether deep inside a building or on a street corner in an urban canyon. 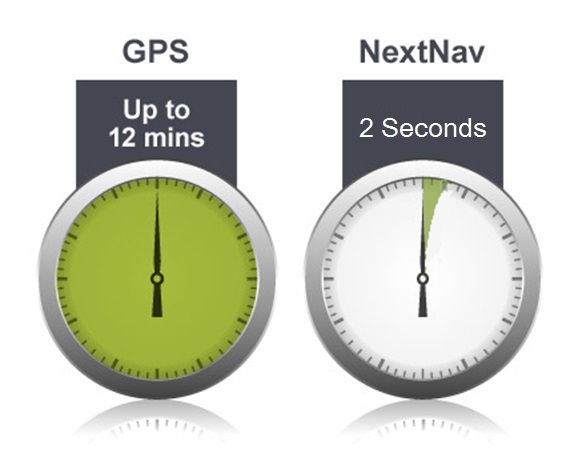 NextNav has designed its system to fit as seamlessly as possible with the existing GPS ecosystem. On the device side, the signal is designed to work with standard GPS correlators. On the network side, the location fixes resemble “stand alone” modes of operation, allowing for many of the existing applications to be reused relatively seamlessly. 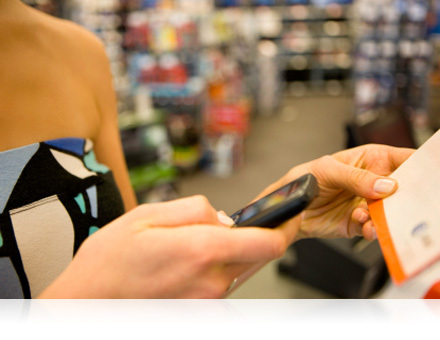 The location solution is presented to the device or network using existing GPS paths. The NextNav solution is computed on the device for significantly enhanced user security and privacy. Unlike network-based technologies such as WiFi, where the position may be computed on a remote server before it is relayed back to the user, NextNav operates a broadcast-only network, which allows the user device to compute its own location—similar to GPS. Transmission is also encrypted. This ensures location information is only available to authorized devices and chipsets, which gives NextNav rigorous control over the quality of our service. Decryption keys are available for various service descriptions and use of our signal is permitted only for the services for which keys have been provided.